This home is ready and waiting for its new homeowner. Come view one of our most popular floor plans, the Gentry, in the exclusive new community, Kings Crossing. With the Master bedroom on the main floor and 3 additional bedrooms with vaulted ceilings and walk-in closets on the 2nd level. You will love the 10 ft. ceilings, elegant arched openings and the 5-in hand scraped hardwood floors that are in the foyer, extended foyer, kitchen, breakfast area, and powder room. The kitchen is spacious in design and features granite counters, travertine tile backsplash, an island and a built-in desk. The family room opens into the kitchen and features a cozy direct vent fireplace and butler&apos;s pantry. The Master bedroom features an impressive trey ceiling, bay window, walk-in closet, his and her raised vanities, separate tile shower, and a garden tub with tile surround. An upstairs loft provides options for an office space or play room. Fully sodded yards and Irrigation system included! 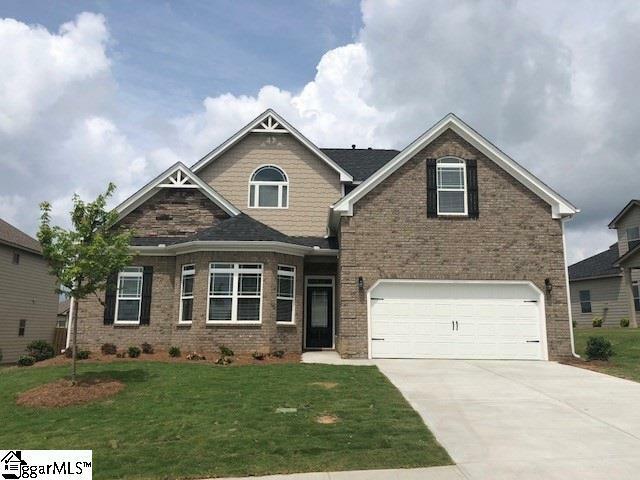 Located minutes from downtown Simpsonville, Woodruff Rd, Fox Run Country Club and I-385. With top rated schools and estate sized home sites, what's not to love?